Extreme temperatures in November— or should we say, Novemburr— can cause the locks on your car or home to freeze. Nothing is more frustrating than trying to get out of the cold into your warm home or car, only to find your entry blocked and frozen. If you try to turn the key too hard, you may end up breaking your key in the lock, preventing your entry entirely and you may need a locksmith to help you into your car or home. What can be done if your locks freeze, but also to prevent it from happening again? If your lock is already frozen, there are a few things that you can try to do in order to melt the ice. The first is to try and heat up your key, with either matches or friction, and then insert the key into the lock. Another method to melt the ice is to coat the key in Vaseline and then wiggle the key in the lock. The vaseline should start to melt the ice, but it may take a few tries. Be careful not to force the key as it might break. You can also try using a blow drier to melt the ice. Attach your blow drier to an extension cord and heat up the lock with the air. If it is ineffective, you can try putting the key in the lock to direct the heat. If the frozen lock is the lock to your front door, you may not have any of these tools. Try pressing your key onto your car’s hot engine block in order to make it hot enough to melt the ice. Always wear gloves when handling hot keys, and never try to defrost the locks with hot water, as the water will freeze and escalate the problem. 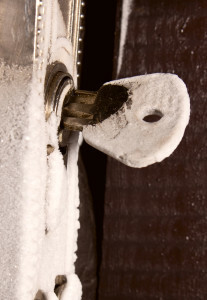 Coating a key in vaseline and putting it in the lock about once a month should help prevent frozen locks. Try to get a keyless entry into your home or car, whether that is a key fob for your ar, or a keyless lock for your home. Install a storm door to help insulate your front door. You can also put a magnet over the lock of your home or car door to help keep it from freezing, although this method does not always work. If your locks continuously freeze, buy a portable keychain lock heater, also known as a lock de-icer keychain to thaw your locks.